Trojans are the programs designed by hacker to get remote access to a targeted computer system .Once a Trojan has been installed on a targeted computer system, hackers may be given remote access to the computer allowing them to perform all kinds of operations.They are not just like viruses,because they are not replicating itself.But it spreads quickly via Internet communication. 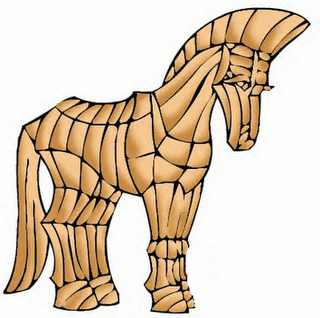 How To Avoid Trojan Horse Infection ? your system to a malicious hacker. 3.Open the files after scanning it using a updated antivirus software,even it comes from your friend. might really be smile.jpg.exe !.Yes,It may be a executable Trojan. 5.Remember a truth:You are not well protected.